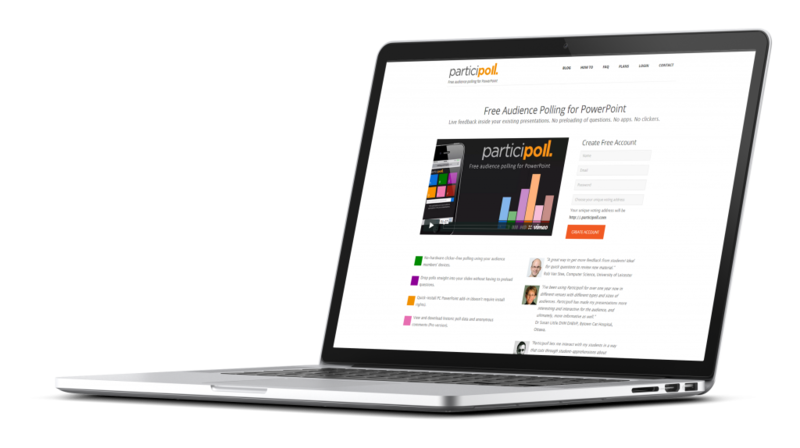 ParticiPoll is an audience polling add-in for PowerPoint that collects votes from audience members’ mobile devices and displays poll results live in PowerPoint. ParticiPoll is a startup joint venture between the Ultimateweb team and a mathematics lecturer. ParticiPoll combines an Amazon AWS cloud-hosted PHP voting engine with a VBA for PowerPoint add-in (COM and macro-enabled versions). We built this product following lean startup methodology including pivoting from a free trial model to freemium and substantial iterations to the on-boarding process to maximise customer conversions.